Bar/Lounge on Deck 6 with 180 degree views. Akademik Sergey Vavilov is almost identical to her sister ship, Akademik Ioffe. There is accommodation on board for just 92 guests with a crew compliment of 65, ensuring you have a safe and enjoyable voyage. In Antarctica there is a strict limit to how many people are allowed ashore at one time, and keeping guest numbers below 100 means that you don’t have to split into groups, and maximum time can be spent ashore exploring. The ship has expansive observation decks featuring 360 degree views over the surroundings, perfect for putting this vast landscape into perspective. Communal areas include a bar and observation lounge, and there is also a library. A selection of movies and documentaries are available to entertain you in the lounge. There is a theatre style presentation room for informative briefings, a gift shop, fitness room, massage room, spa, plunge pool and a sauna. The boat even has a dedicated ‘mud room’ where you get ready for your off-ship excursions. The spacious dining room can cater for all passengers in a single sitting, no need to eat in shifts. Delicious meals are served by the culinary team, aimed to keep you fighting fit and strong for the duration of the voyage. Breakfast is usually a buffet and lunch is a light meal, although there is always a more substantial offering for those with an appetite, you won’t go hungry. Dinner is a three course affair with a choice of dishes, accompanied by an excellent wine list. Coffee and tea is always available, and each afternoon it’s served together with biscuits and cake. There are 6 different cabin categories but all have outside windows making the cabins nice and light. There is ample storage space, and in many cases bunks are converted into sofas during the day, providing another location for relaxing. Most cabins are en-suite though the semi-private cabins will share a bathroom with another cabin. 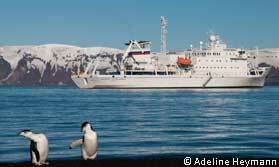 Operates: Akademic Sergey Vavilov operates in Antarctica from late October through to the beginning of April. Specifications: The ship is 117 metres in length and has a cruising speed of 13.5 knots. There are 10 zodiacs onboard and the electrical supply is 220 volts, European pin. The hull is ice strengthened and is ice class Lloyds 1A. Cabins: 43 cabins across 6 types, located on 3 decks. All have windows, the triples on the 4th deck have two portholes. Most cabins have en-suite bathrooms, some will share the bathroom with another cabin. Facilities & Crew: The communal areas of the ship comprise of a dining room, an observatory lounge and bar, presentation room, the bridge, where guests are always welcome, a multimedia room, wellness centre, gift shop and a fitness room. There are 65 staff and crew on board to ensure everything runs smoothly. Itineraries: Akademik Sergey Vavilov runs a variety of different itineraries from 10 to 21 days. Children: Children aged 12 and over are welcome, but do ask as they can be flexible for younger children and there are also family specific departures. We know and love Arctic and Antarctic, and would be delighted to help you plan your perfect trip here. Let us help you plan your perfect tailor-made holiday to Arctic and Antarctic. Talk to one of our travel experts. Tell us what you want, and we will tailor make your perfect trip. An exciting adventure in the intriguing waters of Antarctica. Combining adventure, wildlife, history and science.